Back when you were in school, you had one job: learn. It felt like work because you were required to do it, right? Fast forward a few years to now. You work 40+ hours a week, have countless responsibilities and would love nothing more than to sit down, open a book and expand your horizons. Here’s the reality…whether it’s due to three kids running around the house or an inbox filling up with e-mails faster than you can reply, you simply don’t have the time to read a book. Or maybe you do thanks to this awesome app called Blinkist. Imagine being able to read four books in one day. With Blinkist, it’s possible. How? The app has transformed over 2000 best-selling non-fiction books into summaries you can read or listen to in just 15 minutes, and continues to add more books at a rapid pace. If you’re trying to boost your professional skills, the app offers a wide range of titles to help you learn the key concepts from some of the best books in your field. 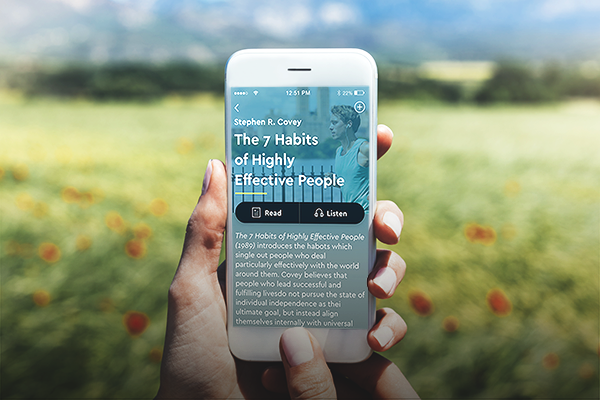 Whether it’s sales, business or psychology, Blinkist provides access to thousands of books that will inspire, motivate and enable you to become a better leader. And it’s not just for career-oriented individuals. Blinkist also features top titles in self-improvement, mindfulness, parenting and other categories that will help you become the best you yet – all within 15 minutes or less! You don’t have to stop learning just because you’re busy. Blinkist fits into your schedule by providing you with two efficient options: read when you’ve got the time and listen while you’re on the go. See for yourself why 3 million people are using Blinkist and loving it. Start your free trial today.